Lizette Richardson has no plans to hang up her hat and ride off into the sunset when she retires as superintendent of Lake Mead National Recreation Area on Friday. She is already settled into the West, has fallen in love with the region and wants to explore other places in the National Park Service that she has served for many years. 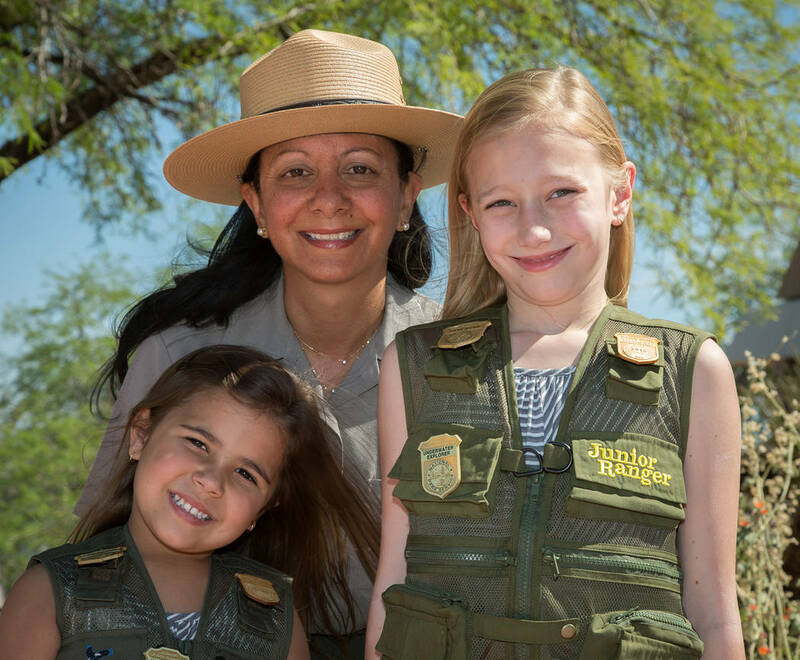 Lake Mead National Recreation Area Lizette Richardson, center, who is retiring as superintendent of Lake Mead National Recreation Area on Friday, spent some time with her nieces Rayni and Kelsey Sukla during junior ranger day at the park earlier this year. “I moved out West over 20 years ago and fell in love with the desert,” she said. as part of a major management shake-up proposed in April. She said her late parents guided her to make the decision to retire instead of accept the new position. She has served as superintendent at the park since October 2015. “My hope is that I was able to make a difference in people’s lives and that I have left Lake Mead in a better place than when I started working here,” she said. Under her leadership, a variety of projects to improve the visitor experience were started, including upgrading roads and modernizing campgrounds. New concessions contracts were awarded, and an update for the exhibits at the Alan Bible Visitor Center was begun. Partnerships, such as the one with the association, are among of the things Richardson hopes continue to grow after she leaves. Last year, Lake Mead National Recreation Area was the sixth-most-visited park in the nation, with about 7.9 million visitors. In addition to her work at Lake Mead, her role as superintendent includes supervising Grand Canyon-Parashant and Tule Springs Fossil Beds national monuments. This is her second role at the park, having served as the chief of maintenance in engineering from November 2004 to June 2013. Before coming to Lake Mead as superintendent, Richardson was the chief of the Construction Program Management Division in the Park Service’s national office in Denver, where she was responsible for developing policy and programs and implementing the planning, design and construction for all of the Park Service’s major capital improvement programs. She also served as the acting superintendent at Joshua Tree National Park, where she oversaw operations for the 790,000-acre park. Before joining the National Park Service, Richardson worked with the Department of Defense at Air Force and Navy installations, as well with the Corps of Engineers, devoting 28 years to federal service.